Gulaab Gang Is Making Us Proud Again, This Time By Fighting Against Open Defecation In Karnataka. Belagavi District Panchayat in collaboration with ASHA (Accredited Social Health Activist) workers are encouraging women from the district to join the Gulab Gang and help district achieve the Open Defecation Free status. Gulaab Gang, a group of fiery women activists have been widely known for their aggressive methods to end evil practices against women, particularly domestic abuse. Under the guidance of Sampat Pal Devi, pink saree clad women aged between 18-60 years have brought in a considerable change in the status of women across North India. 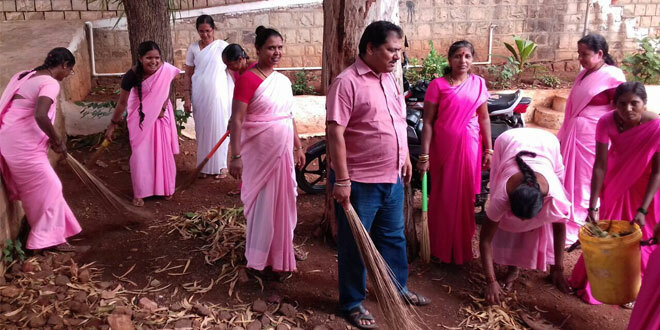 Inspired by the zeal and success stories of Gulaab Gang (GG), CEO Ramachandran, Belagavi District Panchayat in Karnataka formed its own Gulaab Gang in June this year to contribute to Centre’s Swachh Bharat Abhiyanand help the district become Open Defecation Free (ODF). The Belagavi district consists of 10 talukas and around 485 gram panchayats, with a population of about 48 lakhs and nearly 43 per cent of the households were devoid of a toilet as of 2012 survey. In the last 5 years the district panchayat managed to construct individual toilets in majority of these households. As for the remaining 2,28,000 households, the local body has set a target of completing it by 2019. 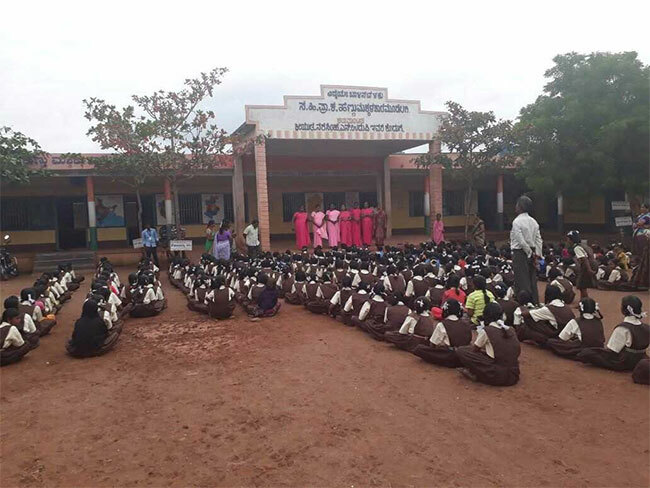 To speed up the process, the Mr Ramachandran in collaboration with ASHA (Accredited Social Health Activist) workers encouraged the local women to form a Gulaab Gang and convince people to end open defecation. 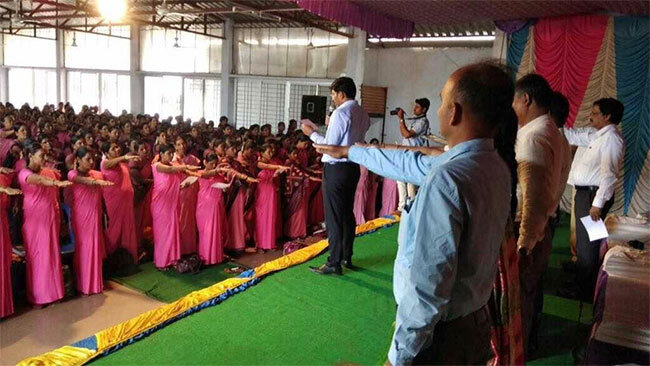 On an average 300 women from each taluka joined the pink gang. To start with, the ASHA workers and the Gulaab Gang targetted houses with pregnant women. From going door-to-door to conducting workshops on hygiene and sanitation lessons, pink members in all talukas are using the ‘fear’ factor to sensitise people, “In the advetisment world, often messages that make people anxious and fearful are used as a USP. Since the monsoon season is at its peak, we are posing questions like, ‘What if your pregnant wife slips while walking on her way to defecate in open?’ and creating fear in people’s mind,” says Mr Ramachandran. These banners are carried by the women wherever they go. While on one side the government is aiding the Gulaab Gang members by marketing for toilets, members with the help of health experts are personally telling pregnant women and their families about the kind of diseases that the child and mother are likely to get infected with if open defecation continues. With all talukas racing towards an open defecation free area, the Gokak taluka has been the fastest among them. Maximum number of local women joining the Gulaab Gang is from this taluka. 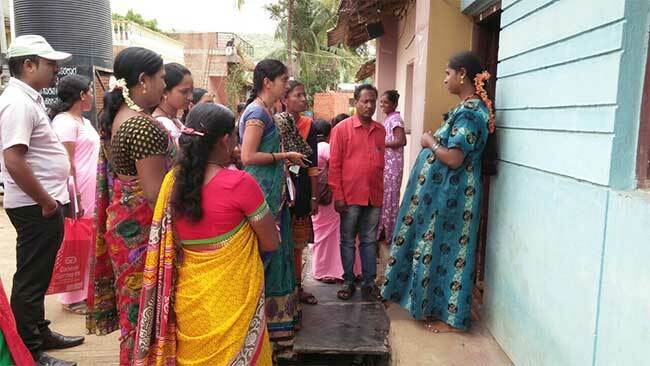 Nearly 3,500 women are aggressively campaigning under Swachh Bharat Abhiyan and in last two months they have been successful in convincing 115 families to build a toilet at home, “We only need to convince another 100 households to make our taluka ODF and we are hopeful of doing so in next two months,” says Mallamma, Mentor, ASHA. The Gulaab Gang members are also visiting schools, hospitals and other public areas and giving lectures on importance of constructing toilets at home, maintaining cleanliness in and around their surroundings. Shramdan (a social service towards maintaining society clean) is conducted every week by the Gulaab Gang members where a shoutout is given to all the citizens to step out from their houses and participate in cleaning activities, “A day is chosen for the cleaning activity, where we involve villagers in activities like clearing litter from roads, sweeping, help civic officials in installing bins, etc.,” says Waheeda, member of Gulaab Gang. With the efforts put in by members of Gulaab Gang and ASHA workers, the Belagavi district is expected to go ODF this year on November 19, which also is the World Toilet Day, confirmed Mr Ramachandran. Previous Post: Jharkhand’s Little Swachh Warrior Pledges To Make India Free From Open Defecation And Waste. Next Post: Rising Above the Superstitions, This Karnataka District Builds More Than 10,000 Toilets In Just Two Weeks.